For courses in reinforced concrete. 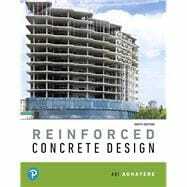 Reinforced Concrete Design integrates current building and material codes with realistic examples to give readers a practical understanding of this field and the work of its engineers. Using a step-by-step solution format, the text takes a fundamental, active-learning approach to analyzing the design, strength, and behavior of reinforced concrete members and simple reinforced concrete structural systems. Content throughout the 9th edition conforms to the latest version of ACI-318 Code. It expands discussion of several common design elements and practice issues, and includes more end-of-chapter problems reflecting real-world design projects. Abi Aghayere is a professor of structural engineering in the Department of Civil, Architectural, and Environmental Engineering at Drexel University in Philadelphia and has more than 20 years design experience in the structural engineering consulting field. He is the co-author of Structural Wood Design (ASD/LRFD), 2nd Edition, and Structural Steel Design: A Practice Oriented Approach, 2nd Edition.